Everyone’s been waiting for the first real phone to come out of Motorola since its acquisition by Google, and the world’s worst kept secret is the existence of an unreleased, and indeed unannounced Moto X handset, which was formally known as the Google X Phone before things got a little on the official end. The company’s own CEO confirmed the handset’s existence back in May, even going so far as to say that it would be made in the United States. Apart from that though, we know next to nothing apart from leaked set of images and slight details. 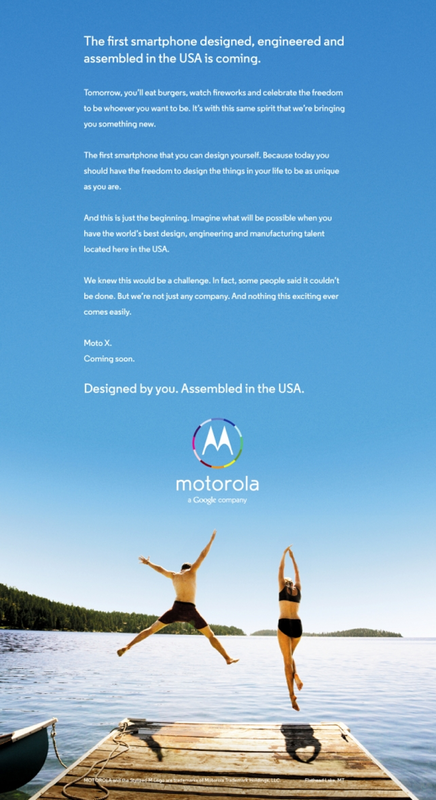 Tomorrow though, Motorola’s Moto X will break cover thanks to a new print ad that will be published in a collection of the States’ largest newspapers. In fact, it’ll be a large, full-color ad that features the company’s new multi-colored logo as well as some more information about the new handset. Well, by more information what we really mean is the ad will tease the unannounced smartphone by suggesting that it will be the first that buyers can design themselves, from a hardware standpoint, that is. Unfortunately, that’s as in-depth as things get this time around, with Motorola preferring to keep potential buyers guessing at this point. The ad’s tagline of ‘Designed by you. Assembled in the USA’ shows that the company aims to make as much as possible of the fact that the device is being made at home, rather than a faceless company abroad. It also feels similar to Apple’s new ads that point out that all of its products are designed in California. It’s an interesting approach to take, but considering Motorola isn’t telling us anything else about the handset, there’s not much more it could do. In fact, Motorola isn’t yet saying anything useful about the phone at all. We’ve no screen size yet, we’ve no carriers and we’ve no idea about what chips will beat at the heart of the Moto X. Maybe that’s why we’re so intrigued by it! And for good reason, quite frankly. We would say we’ve got high hopes for the Moto X, but we’ve been burnt before on these things so until we get some concrete information, we’ll just sit here quietly and twiddle out fingers. Meanwhile, how about you tell us on your own what you want to see from the Moto X? An upgradeable processor maybe? Hmm?